It's that time of the year again. Halloween month. The time that gets my creative side a little more awake and makes me wanna post a ton. 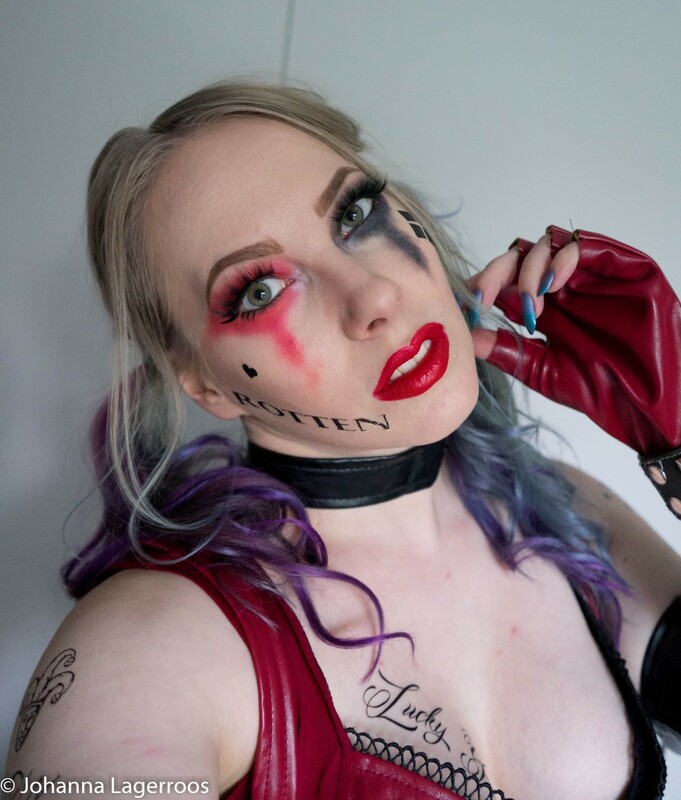 Starting off with this Harley Quinn look, where I combined traditional Harley in her black and red vibes with the newer movie version one. I had so much fun creating this look and taking the photos and I hope this is a good one for kicking off the Halloween season. 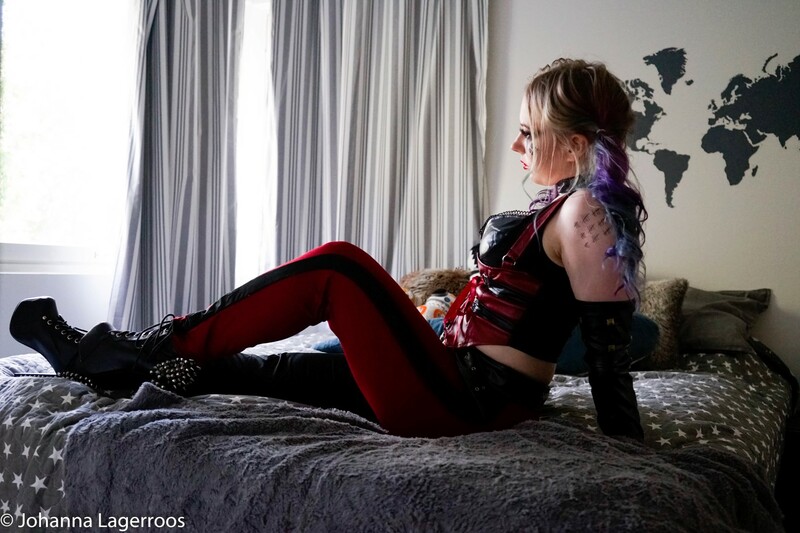 I haven't ever really bought straight up costumes for my looks, but for this one I wanted something on point and dived in eBay to hunt down affordable but yet nice looking costume. Which this totally is. The shoes and the studded bracelet are from my own closet, I feel like they fit the style of this look well. 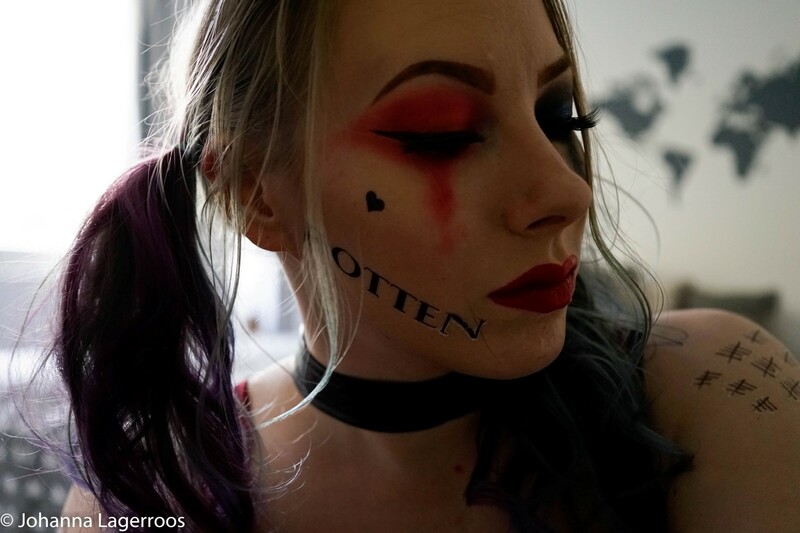 I also got some temporary tattoos to wear with this look, and during me trying all sorts of poses some of them tried to come off like this "rotten" one on my cheek. But apart from this shot I tried to choose photos where you can't really see it. I'm not exactly as athletic as I picture Harley, but you know, this is not about being a carbon copy of anything. Just little old me having fun with costumes. 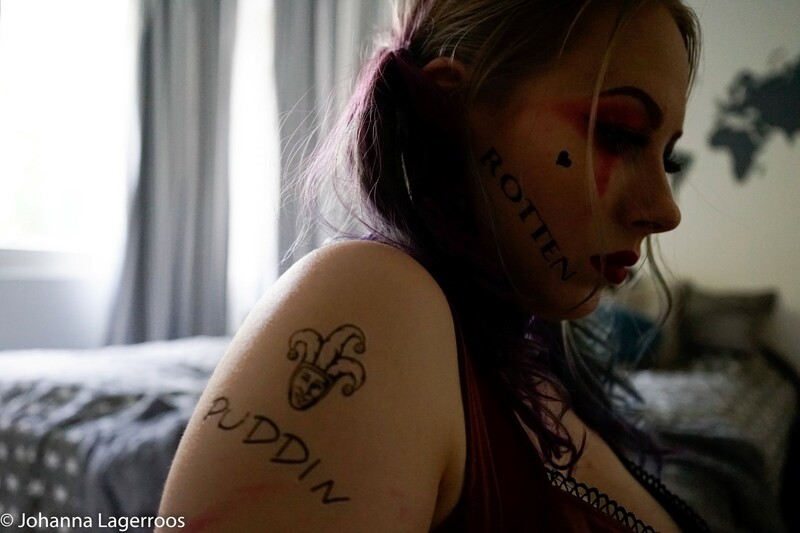 Texting Mr. J. I feel like Harley's bedroom would be little crazier than ours but it's a nice neutral background. 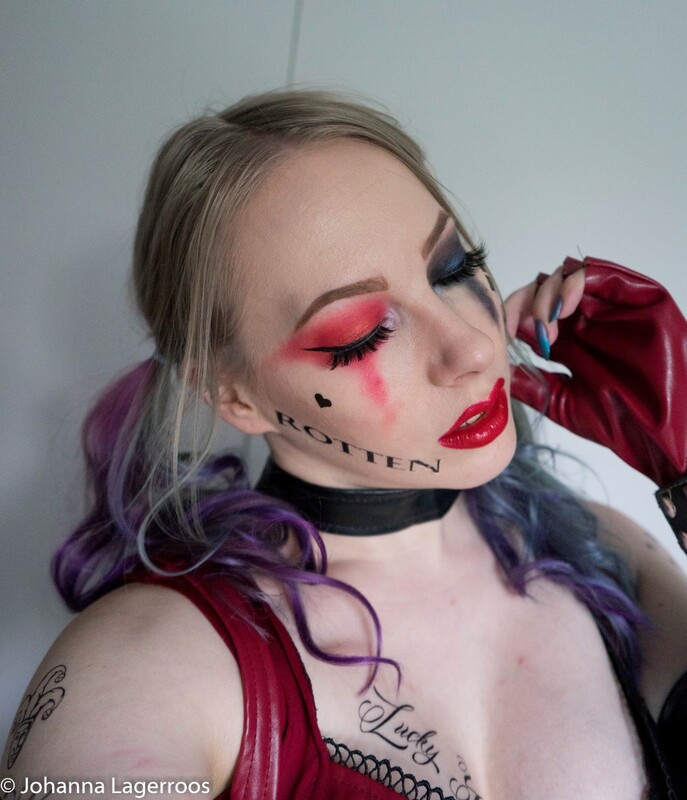 For the makeup, I used bright red one from NYX In Your Element Fire palette, shimmers from September Rose Cosmetics Slush palette (both red and blueish ones, as well as the inner corners) and a black shadow from Freedom Rock & Roll Queen palette. The red lipstick is from Makeup Revolution, and the beautiful lashes are by xoBeauty (they're faux mink, in case you are vegan/cruelty free). 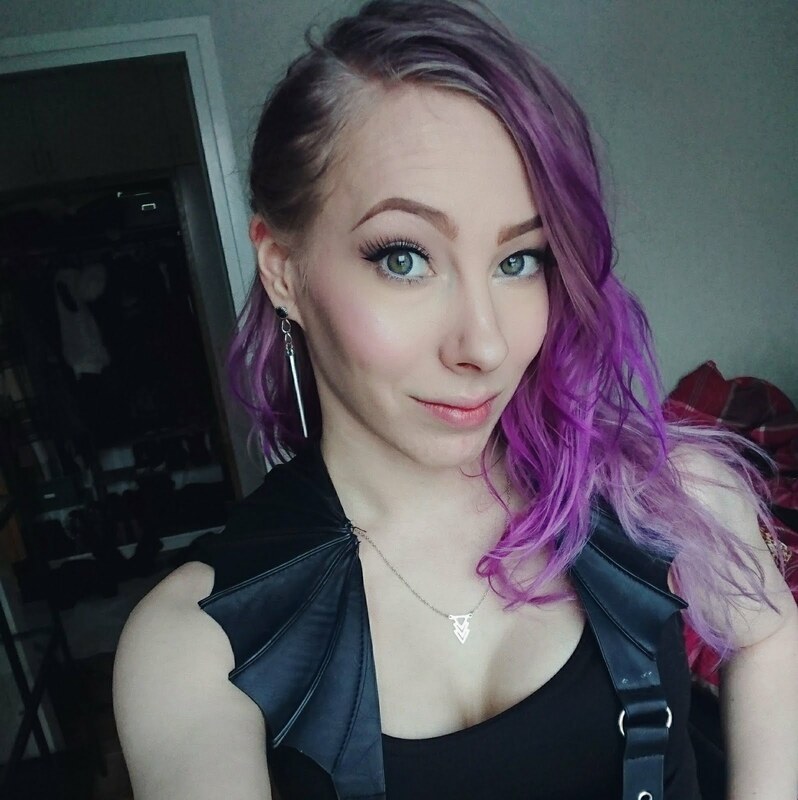 I'm quite happy how this look came out, and it might even be the best one this year - although I have other pretty cool ones coming all through the month. That's all for today, and like I mentioned, other looks will be coming here and there. I will also be posting nails, DIY's and recipes, and I'm really hoping you will like what I've planned! You may also see the böack kitty lurking in the posts in case he happened to be into the things I was photographing. But that's very appropriate for Halloween, isn't it? Remember to follow me/the blog on Bloglovin, Twitter, Instagram or Facebook to see when I post new content! And I'll see you in the next post! very cool and creative Johanna !